Great pattern! I could definitely use some sweet playground playin' mittens! LOve those mittens! They look really cool in the Kureyon. Nice job! Wow! Nice work. I'm impressed with my two designin' pals. a pretty rosebud with her pretty mittens! I think N and R will be sporting these soon! Way to go Liz -- great pattern! Very cool - thanks for the pattern and links! Looks like a great idea... I may have to try some! very cute; thanks for writing up the pattern for us! Great idea! I'll have to try them for some of my little people. Also, your child modeling them is uber-cute. I can't wait to make these! Is the M1R correct? 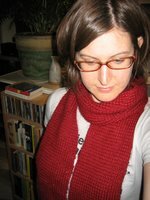 I usually lift the strand from back to front, and then knit the front loop. This gives me a nice increase that mirrors my M1R (done same as yours). Sorry...I meant "that mirrors my M1L", of course. Quick question ... what size DPNS? I've gotta try these, thanks! Hi, I had the same questions as Annonymous...what size DPN? these are so cool! i want some in my size. You have not clearly said where to put the marker .Have you missed out a line of the pattern? Unless your M1L and M1R are to be marked with a marker . I did wish to make these mittens BUT will not be able to now unless you can tell me, please,where is the reference to place a marker? Oh I so want to make these. I don't know if I understand the M1L stuff...do you think I will get it once I start? This pattern looks great but I'm confused by the flap. Are you supposed to bind off the flap? Or leave a tail? Please clarify thank you! I hope I'm not crossing any lines here just trying to help. The dpn is size 6 it doesn't need to be very long there are only 11 sts a needle until the thumb gusset so a 5 or 6 inch would be fine. It doesn't really matter how long they are its more personal preference. Yes the m1 is correct just follow what she says and its fine. No you do not cast off the 12 sts for the flap leave them on a seperate dpn and just cut your yarn that's why you need 5 needles. You cast off 12 sts on one round then on the next round you knit 2 then knit the sts that are on the needle you knit for the flap using your working yarn. There's a pattern for big people called ipod mitts that are very similar to these.